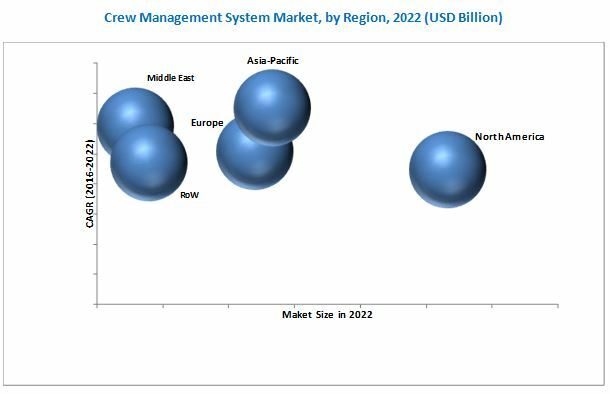 [146 Pages Report] The crew management system market is projected to grow from an estimated USD 1.31 Billion in 2016 to USD 2.35 Billion by 2022, at a CAGR of 10.19% from 2016 to 2022. The objectives of this study are to analyze the crew management system market, along with the provision of statistics from 2016 to 2022 as well as to define, describe, and forecast the crew management system market on the basis of application, system, device, and region. The year 2015 has been considered the base year, whereas, 2016 to 2022 has been considered the forecast period for the market study. The crew management system ecosystem comprises airline software solutions providers such as Sabre Airline Solutions (U.S.), Lufthansa Systems (Germany), Jeppesen (U.S.), Hexaware Technologies (India), and IBS Software Services (India), among others, and component manufacturers such as Fujitsu (Japan), Intelisys Aviation (Canada), AIMS, Inc. (U.S.), Blue One Software (Belgium), PDC Aviation (Denmark), Aviolinx (Sweden), and Sheorey Digital Systems Pvt Ltd (India), among others. “This study answers several questions for the stakeholders, primarily which market segments they need to focus upon during the next two to five years to prioritize their efforts and investments”. 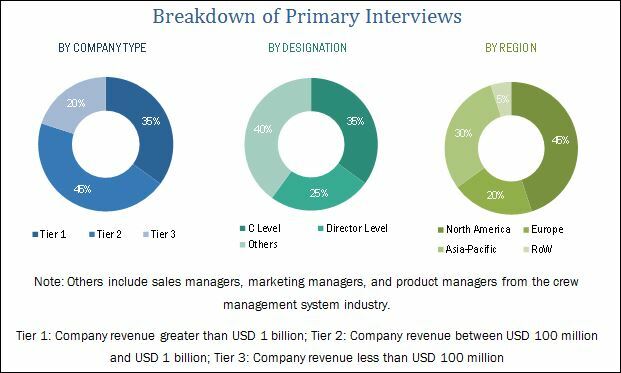 The crew management system market is projected to grow from an estimated USD 1.31 Billion in 2016 to USD 2.35 Billion by 2022, at a CAGR of 10.19% from 2016 to 2022. Stringent regulations pertaining to working hours for crew members on board, safety of crew members and passengers are the major factors driving the crew management system market. Among systems, the on-cloud segment is expected to lead the crew management system market during the forecast period. The cloud computing technology is having an increasing impact on daily life, and the aviation industry is no different. An increasing number of airlines are adapting to the cloud technology to obtain ease of operations and excellence in client servicing. On the basis of device, the tablet segment of the crew management system market is expected to grow at the highest CAGR during the forecast period. This is attributed to the introduction of the use of tablets for cabin crew to reduce complicated paper-based/manual operations in performing their day-to-day functions like meal distribution and passenger management. The crew management system market in the Asia-Pacific is expected to grow at the highest CAGR during the forecast period. Growth in passenger traffic has resulted in increased demand for new aircraft in the region, which is anticipated to boost the crew management system market during the forecast period. These factors are expected to positively affect the region’s aviation industry, which will in turn drive the Asia-Pacific crew management system market in the forthcoming years. A stagnant product lifecycle is a major restraint for growth of the crew management system market. The lifecycle of crew management system is 15-20 years; these systems are upgraded post the mentioned timeframe. Therefore, the market is expected to remain stagnant, in terms of technology for a long time. Several major players are present in the crew management system market. Some of these players are Sabre Airline Solutions (U.S.), Lufthansa Systems (Germany), Jeppesen (U.S.), Hexaware Technologies (India), and IBS Software Services (India) among others. Sabre Airline Solutions (U.S.) is one of the leading companies in the crew management system market. The company has been focusing on securing contracts to grow in the crew management system market. It also has a diverse product portfolio, and invests heavily in research and development. 12.12 Sheorey Digital Systems Pvt. Ltd.